What two substances comprise the bone matrix? True or False: Bones increase or decrease their mass as needed. If you’ve studied the 7th grade Apologia textbook, Exploring Creation with General Science, you know the answers to these questions! Are bones alive? Yes, your bones are composed of living cells. Bone continually changes to meet your body’s needs. What two substances comprise the bone matrix? Collagen and minerals. Collagen is a flexible substance that belongs to a class of chemicals known as proteins. Minerals are substances found naturally in the earth. Collagen and minerals work together to make bones both strong and flexible. The collagen gives bones their flexibility; the minerals give bones their hardness. True or False: Bones increase or decrease their mass as needed. True. Bones that bear weight must be firm. So, if you exercise, your bones will be stressed and will respond by increasing their mass to become more firm. If you are inactive, bone tissue will be taken away. Now! We’re all at least as smart as the 7th graders who’ve studied this book! 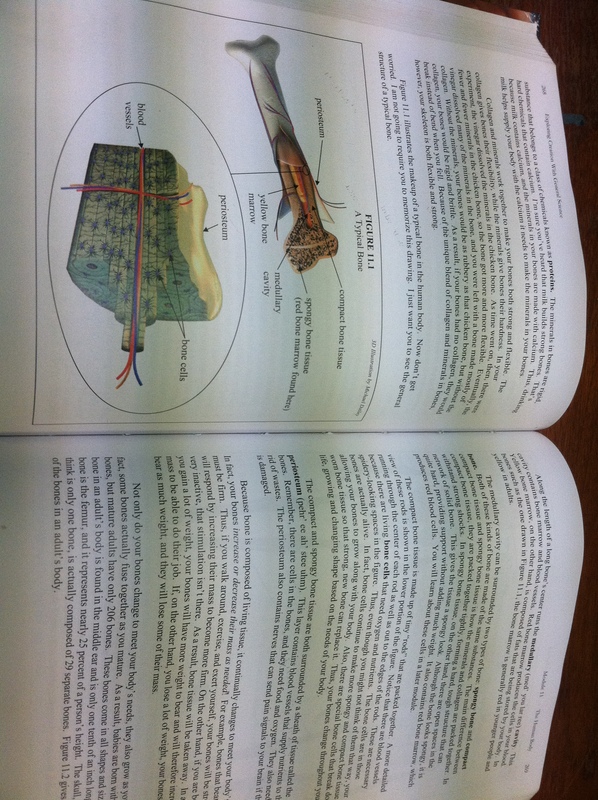 I’m getting the exercise my bones need now, but I still have a lot to learn about the minerals. Calcium is only one of the minerals my bones need. What have you learned? Care to share? I’d love to hear from you. Email or comment and tell me what you’ve added to your diet to help your bones. Thanks! I’ve heard from several of you who have also been working in the bone density department. Thanks for your encouragement! I thought you might like to see more detail of what my friend Kristin shared with me. 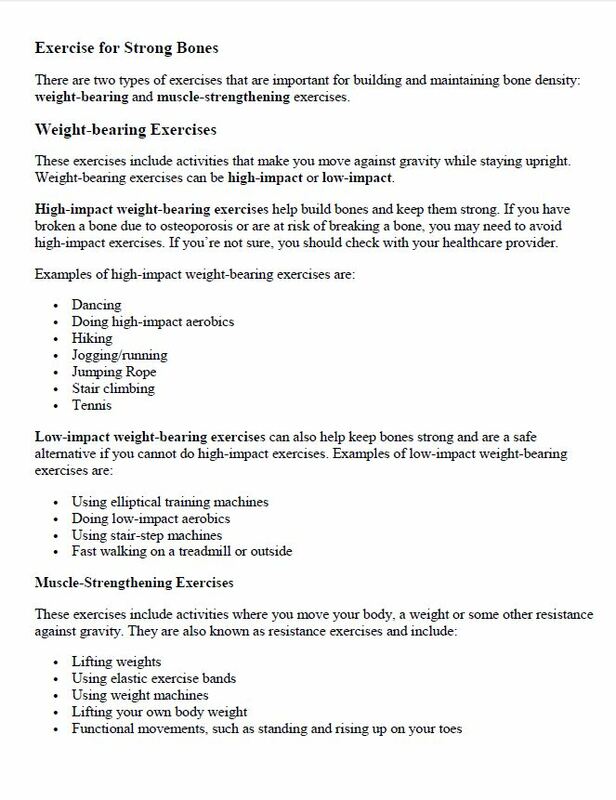 The “Exercise for Strong Bones” pages include information from the National Osteoporosis Foundation, modified slightly for me. If you can’t read it, click on the images to enlarge. I’m a little embarrassed to admit that I didn’t understand the connection between exercise and bone health. I was hoping I could just take a supplement and forego the exercise, but that’s just not how the body was designed. I’ve learned some fascinating things about bones and muscles, so check back here later for more of my discoveries. Please share what you’ve learned about building bone density! I love to hear from you! Those were the words at the top of the page my friend Kristin sent me. So, Kristin came over and helped me get started with an exercise routine. I began with 6-pound weights, a list of exercises, and Kristin’s encouragement to work out for 30 seconds and rest for 15 seconds. 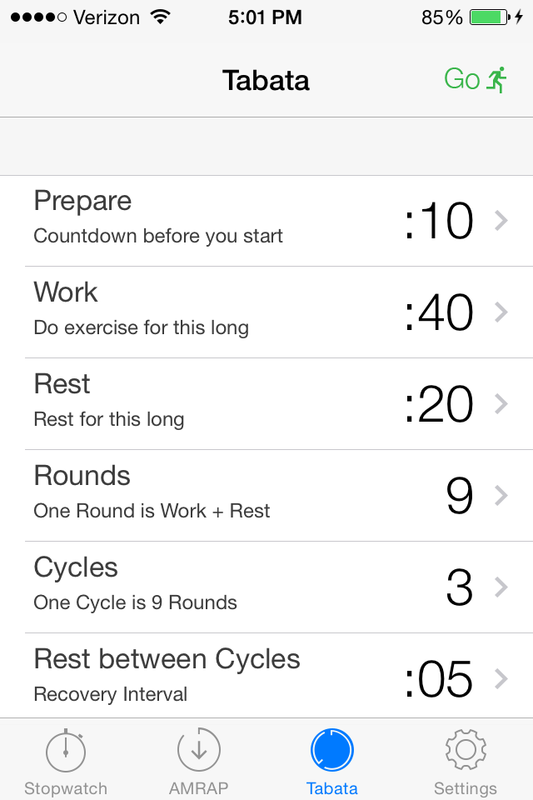 I found a free app to help me with the intervals, and I think the fun of that app kept me going those first few days. I found it at pushpress.com, and it has a great feature called Audio Assist. I have no idea who these people are, but their encouraging voices tell me when to start and when to rest. I chose the voice of Elyse Umeda, simply because hers was the most like Kristin’s of all the choices. 🙂 When I get all the way through my workout, that voice says, “Time! Great job!” Ah! Music to my ears and to my tired muscles!! This is how my routine looks now after working up just a bit. I work for 40 seconds and rest 20, and my whole workout takes about 27 minutes. 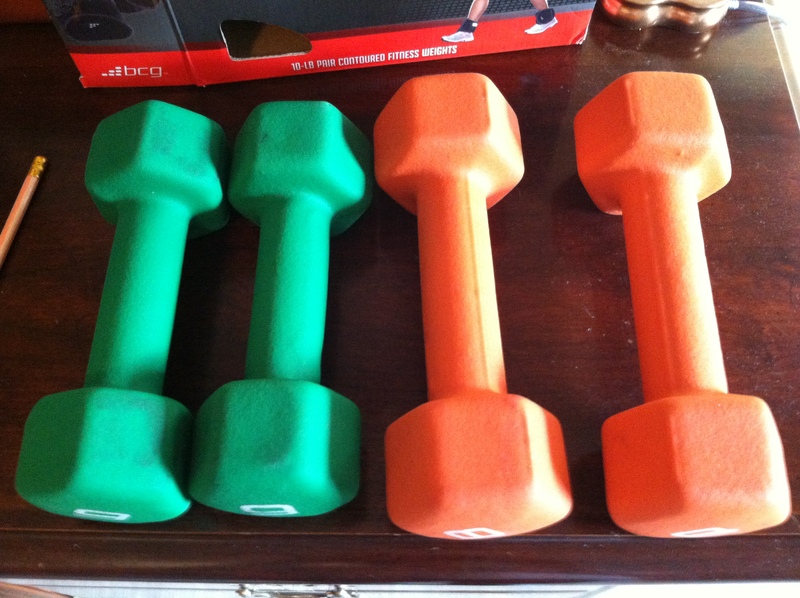 I now work with 8-pound weights for my first cycle and then switch back to the 6-pounders, and I also wear 3-pound ankle weights. My plan includes three days of this workout, three days of other exercise (once a week it’s 30 minutes of intense housework, sometimes it’s a vigorous walk, and occasionally it’s my regular workout exercises except without the weights), and one day of rest. I feel my muscles. I sure hope it’s helping my bones!! But when I actually evaluated what I had been doing, it really wasn’t all that much. I was taking a great multivitamin (SuperMom) and I was attempting to eat healthier, but I really hadn’t added much calcium to my diet, and I still hadn’t learned much at all about the importance of other vitamins and minerals. So, I started with almond milk. I bought Silk first, original and unsweetened. I found the unsweetened to be UN-drinkable. 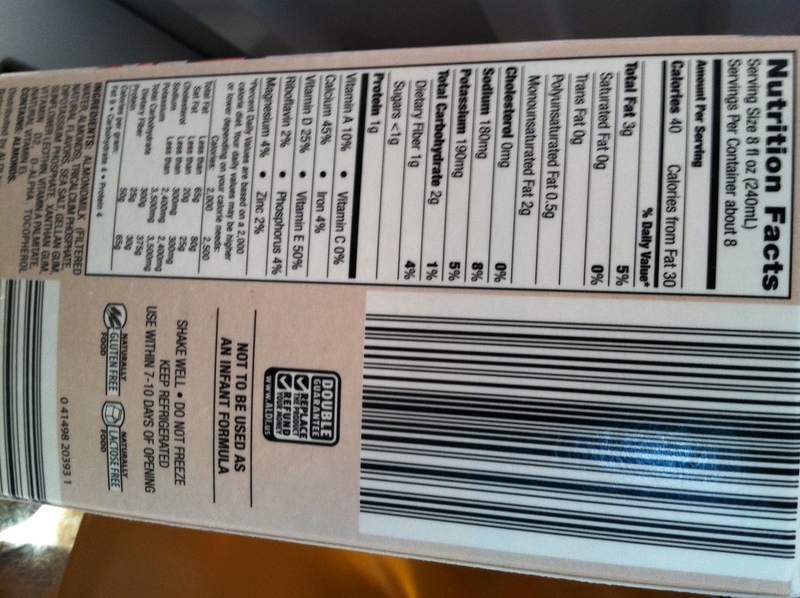 I wasn’t happy with the amount of sugar in the original, so I was thrilled when I tried Aldi’s Friendly Farms Unsweetened Vanilla AlmondMilk. It was actually good! I even prefer it over dairy milk now. 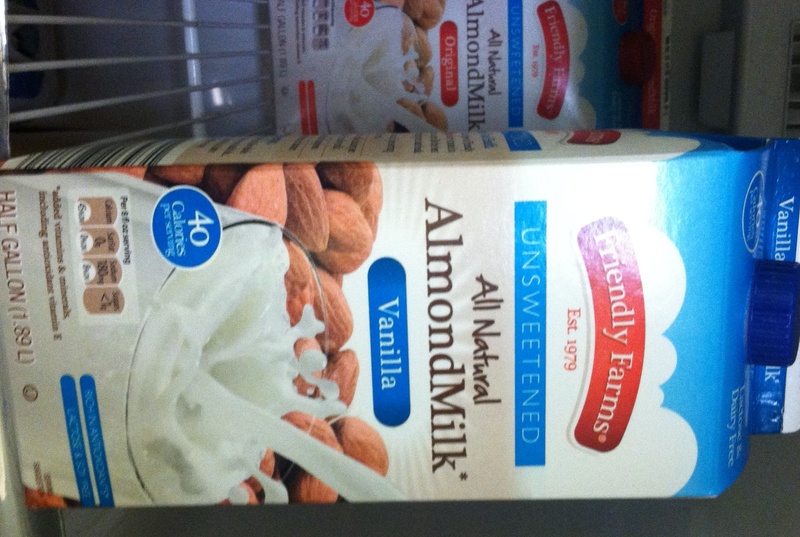 One cup of AlmondMilk contains 45% of the RDA for Calcium, so this has been an important addition to my diet. Calcium is only one of the nutrients needed for healthy bones, and I have a lot to learn in this department. I’ll be blogging more about that soon. How about you? What dietary changes have you made for your bones? Any recommendations? This is a DXA Bone Densitometry Report. To be exact, it’s two of those–one from 2012 and the other from 2014. What they actually say is that from February 2012 until August 2014, I lost bone density and I already didn’t have that much to lose. The latest report tells me that I’m osteopenic with a T-score of -2.4. I learned that a normal T-score for my age is -1 or higher. If someone has osteoporosis, the T-score is -2.5 or lower. My T-score is awfully close to osteoporosis. 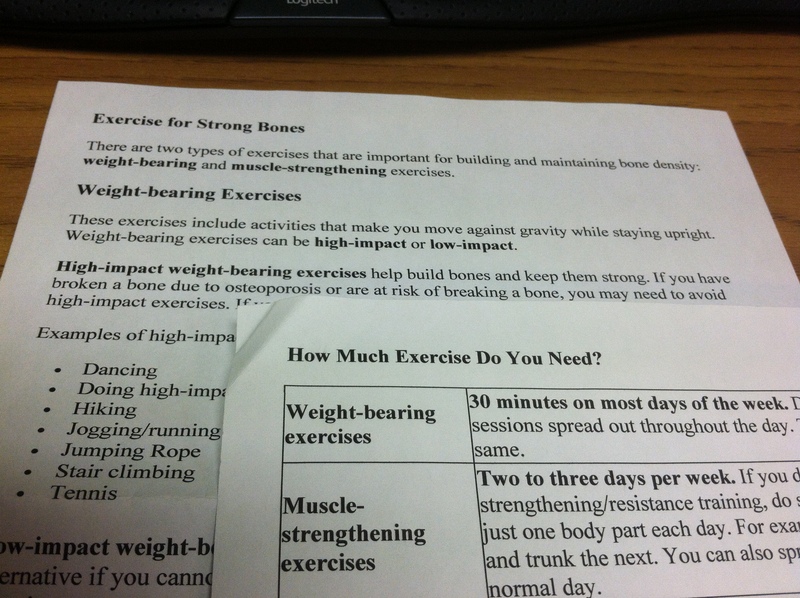 So, I’ve been learning about bones and bone density, and I’ve found out that I have a lot to learn! Do you have any advice? Please comment! I’ll be sharing what I’ve learned in the next few days, and I’d be thrilled if you would share, too!